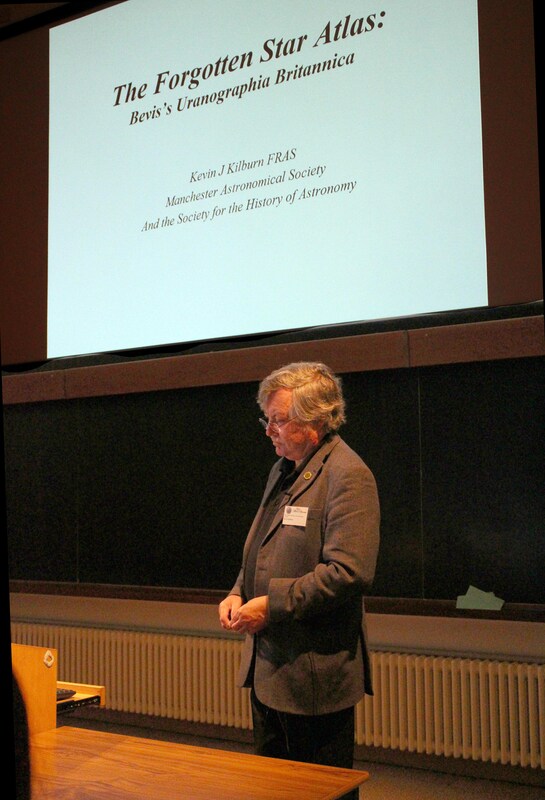 The Society for the History of Astronomy Spring conference was held at the Institute of Astronomy, Cambridge on the 21st April 2018. A record number of 108 delegates were warmly greeted at the door by the SHA meetings organizer Dennis Osbourne. 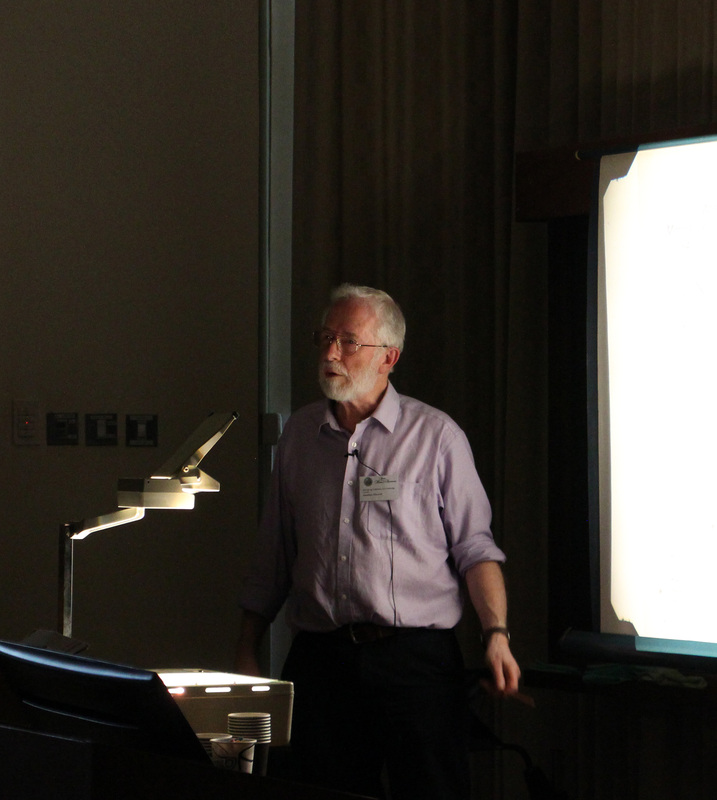 Initial introductions and a brief welcoming talk was given by the SHA Vice-Chair David Sellers. 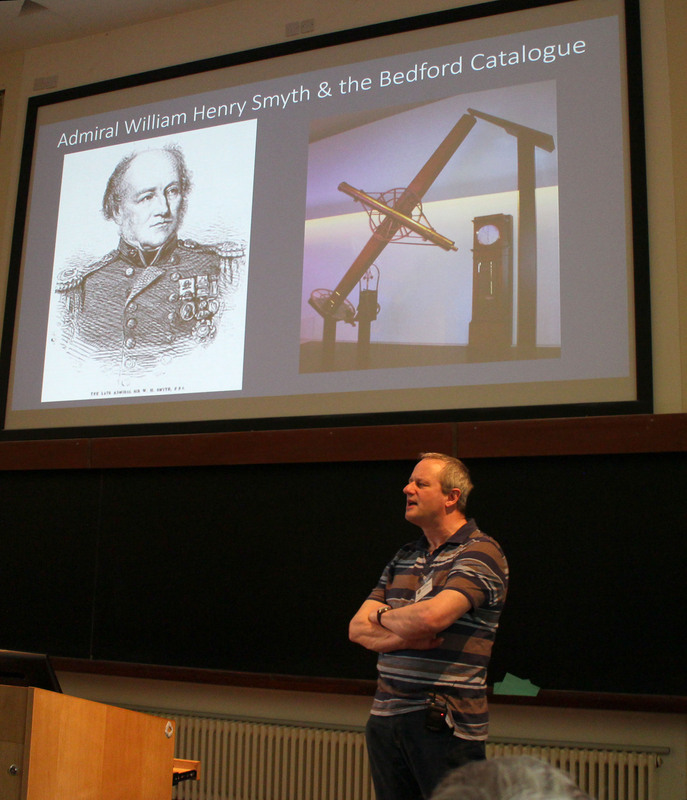 He expressed that the talks had a wide range of subject matter from forgotten star atlases, archaeoastronomy, history of astrophotography, and Admiral William Henry Smyth and there should be something which would appeal to everyone in attendance. The day’s events would start with a trip to the far south west of the UK looking at the Archaeoastronomy of Cornwall. This talk was given in two parts. The first half about West Penwith and the Isles of Scilly was delivered by Carolyn Kennett and the second half about the Hurlers and Bodmin Moor was by Brian Sheen. 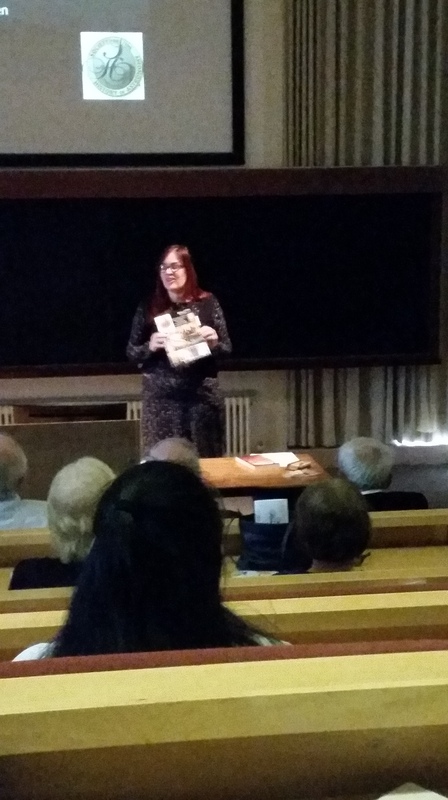 Carolyn explained how archaeoastronomy has a real relevance to these areas and there are many monuments ranging from the Neolithic to the Iron age which show evidence for alignments in West Cornwall. There have been several studies conducted within the region, these include work untaken by Edwin Dunkin, Norman Lockyer and most recently Michael Hoskins. The talk gave a quick introduction to the methodology used when looking for alignments and how there is evidence for both solar alignments and lunar alignments in the stone circles in West Penwith. The Isles of Scilly is more complex in nature and although several barrows are known to align with the summer solstice sunrise many do not seem to follow this pattern. Carolyn then moved far further forward in time to the Iron age, explaining how Fogous found in the far south west were aligned to the summer solstice sunrise. Brian Sheen spoke about the evidence on Bodmin Moor. He has spent many years working at the triple stone circle site The Hurlers. He explained how this is a complex site, although there is a solar aligned circle Cradock Moor within the immediate locality. The circles at the Hurlers has been the focus of a few projects trying to unpick its secrets, these have included a reexamination of the interlinking pathway, the discovery of the single menhir in the position of a possible fourth circle (now defunct idea). All this has enabled a deeper understanding of the archaeoastronomy of the site. More about this work is included in this Bulletin 30. The following talk by Kevin Kilburn on the John Bevis’ “Uranographia Britannia” the forgotten Star Atlas, was a fascinating tale of a lost masterpiece and how through diligent research, the evidence has been pieced back together of what transpired to the original Atlas and a large number of printed pages. Only three intended Uranographia Britannica are known and these are incomplete. The ambitious project had been financially backed by John Neale, who subsequently became bankrupt. The project was incomplete, and all the printing plates and pages were taken to pay his executors. Apart from the original three Uranographia (known to exist) large number of printed pages were put together to form a near complete Atlas sold in 1786 as Atlas Celeste. A copy of Bevis Atlas Celeste has been discovered by Kevin Kilburn in the Manchester Astronomical Society library. All the other known copies of Bevis Atlases can be seen on the societies website. http://www.manastro.co.uk/bevis.html We thank Kevin for a very interesting talk. During the break for lunch many delegates took advantage of the warm summer day and were able to eat their lunch on the lawn, Rob Peeling also gave a short talk about his ongoing research into the life of Admiral William Henry Smyth. Rob Peeling had searched through the Hartwell papers held by the Royal Astronomical Society. In a box of correspondence between the Smyths and Dr John Lee, he found a soft covered book of observations which he initially assumed were by Smyth. However, inside the front cover was written, “In a letter to my nephew, J. Herschel”. The date on the front cover was 1783. 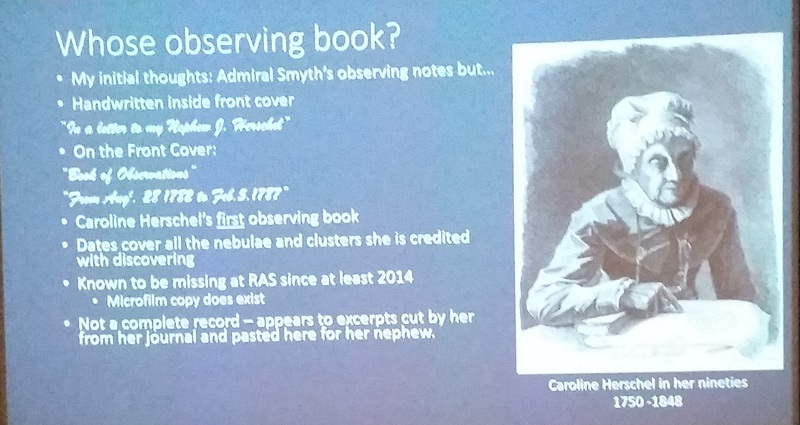 The observations were the first by Caroline Herschel (the book is actually excerpts from another original journal. This book has not been seen since before 2014 and was feared to be lost. The observations cover the period in which Caroline discovered or independently re-discovered all 14 of the clusters and nebulae attributed to her. Rob showed a number of these discovery records and how they are often accompanied by the phrase, “Messier had it not”. The first page of the book includes Caroline’s instructions from her older brother, William on what he wanted her to record. This is under the heading, “to be wrote down”. Caroline also recorded the conditions she observed under, including the evocative, “ice on tubes”. Nik Szymanek was the first speaker after the lunch break. He covered the topic of the History of Astrophotography. His talk explored the early forays and successes that historic astrophotography’s such as Henry Draper and Edward Emerson Barnard. In 1959 amateur astrophotography’s started by using black and white film to image the night sky. Nik showed wonderful images taken by amateurs through the ages. Explaining the developments of the technology and how this has improved the results to the current day. He peppered his talk with personal successes and sometimes failures that he had along to way. 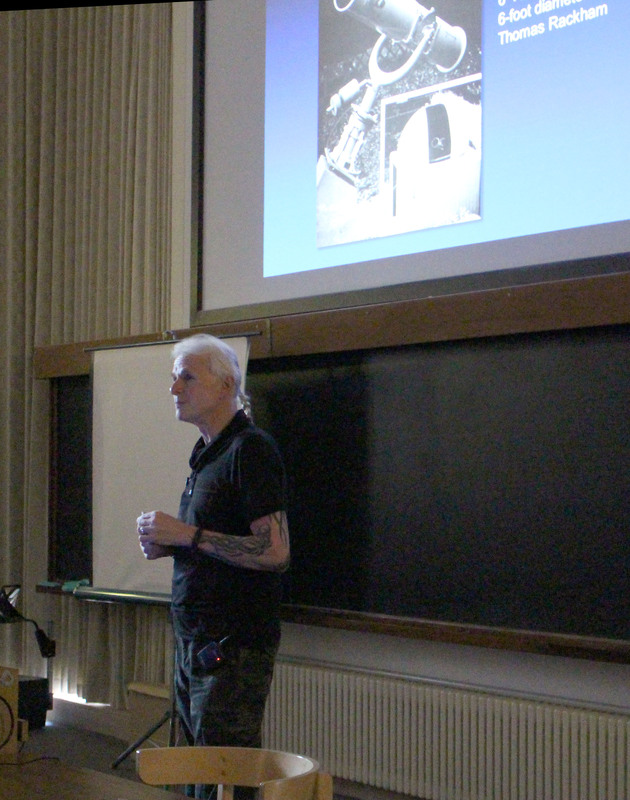 Astrophotography is Nik’s passion and his deep knowledge in the subject shone throughout this fascinating talk. Around about 1730, Chester Moor Hall invented the first achromatic doublet lens. This was a major turning point in the development of telescopes and a spectacularly successful invention which has been a foundation stone on which all optical instrument industries, not only telescope making industries, have depended on ever since. A lot of interesting lesser known developments happened in the evolution of refracting telescope objectives before Chester Moor Hall, and a lot of similarly interesting things happened afterwards too. The history of some of these developments are not as well understood as we might wish. Long before Chester Moor Hall, Ibn Sal in 984ad (a Persian scientist working in Baghdad) determined the geometry of refraction in transparent materials (“Snell’s law”) which enabled him to design conic aspheric surfaces to remove spherical aberration in lenses, for the purpose of improving the efficiency of burning using the Sun’s rays. These surfaces became known as Cartesian Ovals, named after the 17th century philosopher Descartes, who promoted them as being his invention. Thomas Harriot re-discovered Snell’s law in 1602, but probably didn’t know about Cartesian Ovals. Descartes, fairly certainly, got to know about Snell’s law and Cartesian ovals from Snell around about 1621 (this is still debated). Snell was a professor of Mathematics and had studied Arabic texts on optics, and it is possible that he got his law, and the knowledge of Cartesian Ovals from either an original Arabic manuscript of Ibn Sahl, or from a Latin translation of Ibn Sahl’s work. Snell died in 1626. From about 1630, Descartes propagated the knowledge of “Cartesian” Ovals to savants of astronomical telescope manufacturing, in particularly the use a convex Hyperbolic curve on their objective lenses. But hyperbolic curves were very difficult to grind and polish at that time (and, like all aspheric surfaces, still are), and what is more, from the lens design point of view, a hyperbolic curve introduces massive amounts of Comatic aberration, and of course does not correct Chromatic aberration. However, in 1660, Christiaan Huygens told Christopher Wren that he had discovered that a combination of a convex and a concave lens could correct spherical aberration, thereby releasing the telescope optics community from the heavy yoke of hyperbolic curves and opening the door for Chester Moor Hall’s invention of the achromatic lens, and possibly opening the door for Robert Hooke and Isaac Newton’s understanding of chromatic aberration correction in lens systems. At this point in the talk a major controversial topic was introduced: did or did not Newton know that chromatic aberration could be corrected in lens systems? Certainly, Newton publicly proclaimed that Chromatic aberration could not be corrected in lens systems, but, reviewing the literature about this (Newton’s optical work) a strong case emerges for Newton knowing that it could be corrected in lens systems. The speaker showed illustrations from Newton’s works, and one constructed from the words in one of Hooke’s works, showing that both men were close to knowing that chromatic aberration can be corrected in lens systems. Why did Newton not make this publicly clear? The speaker’s opinion was that It may be that Newton was not quite sure about it in his own mind, or it may be that he didn’t want to admit that Robert Hooke was correct when he said (of Newton’s reflecting telescope) that there was no necessity for reflecting telescopes! Jonathan then dealt briefly with some interesting but well-known developments in the late eighteenth and early nineteenth century to do with liquid lenses (such as had been used by Newton and Hooke) by, notably, Robert Blair and Peter Barlow. He went on to about two neglected heroes of the Victorian era: William Wray who had worked the optics of two major telescopes for James Buckingham (that were the largest aperture refractors in the 1860’s), and an apochromatic lens that used baked resins instead of flint glass. And the Reverend Vernon Harcourt who, from 1834 to 1872 (when he died) worked with George Gabriel Stokes to develop glasses that could correct Secondary Spectrum in telescope objectives. In that work Harcourt tried just about every possible chemical in glass melts. After he died George Gabriel Stokes published a paper explaining Harcourt’s indefatigable work and was then approached through an intermediary to explain Harcourt’s work to a Professor Abbe of Jena…In 1886, the Schott/Zeiss glassworks published their first glass catalogue, based on much of the chemistry that Harcourt had investigated. 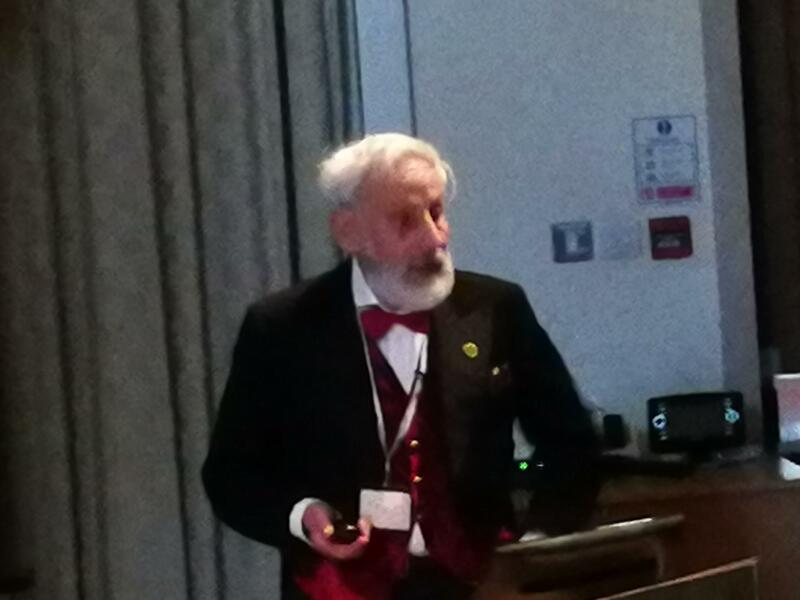 Finally, Jonathan talked about a better-known hero of the Victorian era: H. Dennis Taylor of the T. Cooke and Sons company in York, who in 1892/93 published patents for two very different triplet lens systems. These were a Photo-Visual (apochromatic) lens (the first apochromatic telescope objective) deploying some of Schott’s new glasses, and a flat field anastigmatic lens that was advertised for wide field astronomical photography, but which also found a home with the Taylor, Taylor & Hobson Company in Leicester as a general photographic lens. The afternoon break gave the attendees their final opportunity to look at the book sale that James Dawson, the SHA librarian, had organised. There were many books for sale, all from the field of astronomy, with lots of them about the history of astronomy. This was a well received and great addition to the spring conference. 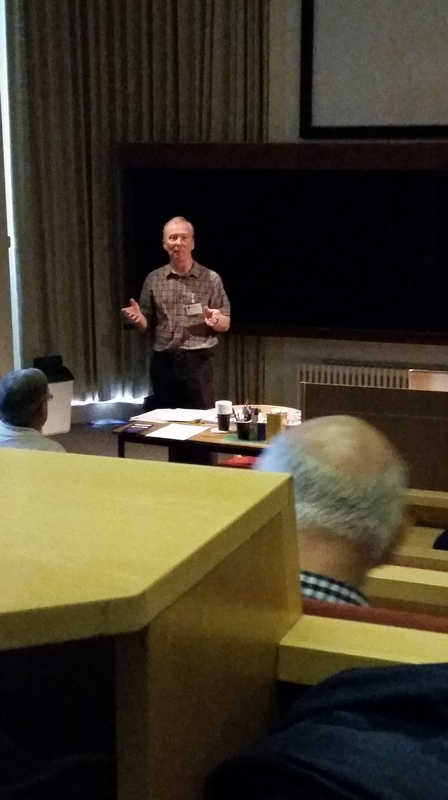 The last session of the day was filled by Rob Peeling and Bob Marriott. Rob Peeling spoke first about Captain William Henry Smyth. In 1844, Captain William Henry Smyth published the Cycle of Celestial Objects, including the Bedford Catalogue. Smyth’s observing notes for each of the objects are as fresh and relevant today as they were 174 years ago. They remain a valuable companion for those wishing to develop their visual observing skills. However, there is a constraint. Owing to the early date of publication Smyth uses 1840 epoch coordinates together with object designations that are now obsolete. These include designations by William Herschel and from John Herschel’s Slough catalogue and Piazzi’s Palermo star catalogue. It is therefore difficult for a modern observer to check which object is being referred to. Rob Peeling precessed the Smyth’s position data to epoch 2000.0 and using various techniques has identified all 850 objects in the Bedford Catalogue together with any other objects or stars mentioned in Smyth’s note. It is now once again possible to hone one’s observing skills with Admiral Smyth as your companion and guide. The updated Bedford Catalogue can be found on the Webb Society’s website at https://www.webbdeepsky.com/publications/free/. 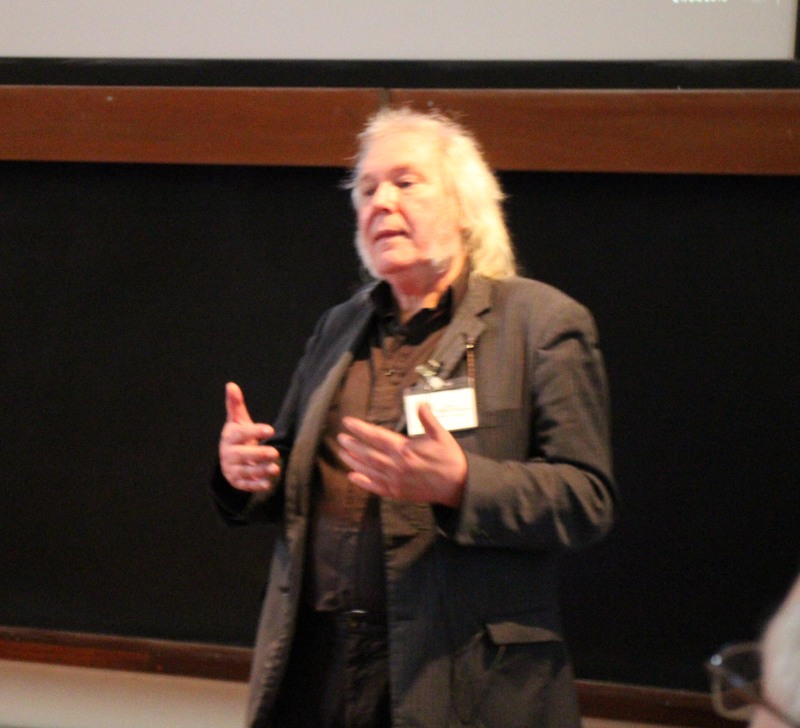 Bob Marriott then spoke on ‘The Silver-on-Glass Revolution.’ The arrival in the 19th century of glass telescope mirrors coated with silver, was a revolution for amateur astronomers because, almost suddenly, they could make large and small telescopes much more conveniently. Since the invention of the reflecting telescope in the 17th century, mirrors had been made of speculum metal – an alloy of copper and tin that could be polished to produce a reflective surface. Speculum metal is much heavier than glass and tarnishes quickly, and mirrors required frequent re-polishing. The process of production of silver involving silver salts, aldehydes, and sugars was discovered in the early 1830s by the German chemist Justus von Liebig. The silvering process was developed over many years and numerous patents were registered by many researchers, but it was applied primarily for decoration and ornamentation and it was not until the 1850s that a sufficiently fine and stable silver deposit could be produced that was good enough for astronomical purposes. The first telescope with a silver-on-glass mirror was built in France by J. B. L. Foucault in 1857. Two years later, Henry Cooper Key and George With, both of Hereford, made the first silver-on-glass mirrors in England, and in the early 1860s George Calver began commercial production of silvered mirrors. Over many years, With produced about two hundred mirrors, while Calver established a business and produced countless numbers of mirrors and complete telescopes – a business that he maintained for sixty-five years until his death at the age of 93 in 1927. The deposition of silver on glass remained the standard technology for telescope mirrors for seventy years, until the advent of aluminium coatings around 1930. The SHA would like to thank all the speakers for their informative and extremely enjoyable talks. It was lovely to catch up with lots of familiar faces and also to welcome 3 new members who signed up on the day. We look forward to seeing you all again at the summer picnic on Saturday 30th June at the Seething Observatory, Thwaite St Mary, Norfolk. This entry was posted in News on April 29, 2018 by societyforthehistoryofastronomy.